LARGE crowds flocked to Athy’s Emily Square on Saturday last 10 November as a plaque dedicated to Stone Roses and Primal Scream bassist Mani – also known as Gary Mounfield – was unveiled outside The Emigrant. Before officially launching the plaque, the musician laid flowers on his mother’s grave in Maganey, accompanied by his wife and two sons. They also visited the house his mother grew up in and met the current owner. The Doyle family once lived just a few doors down, including the mother of the Smiths’ Johnny Marr who was fêted in the town the week before. 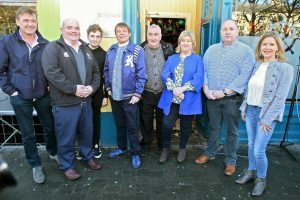 Pictured at the Made of Athy plaque unveiling at The Emigrant by Mani from The Stone Roses were Dominic Hanniga, Cllr Mark Wall, Fintan Walsh, Gary “Mani” Mounfield, Colm Walsh, Cllr Aoife Breslin, Mark Redmond and Lucina Russell (KCC). The plaque is the fourth to be unveiled as part of the Made of Athy initiative, honouring musicians with links to the town. Judging by the age range of the crowd in Emily Square, Mani’s appeal very much spans generations. “I always get a kick out of fans and the enthusiasm that they bring. It’s brilliant, lots of people got their record signed,” said Colm Walsh, the project’s curator. A plaque dedicated to broadcaster and producer Bill Hughes will be unveiled by Panti Bliss on 23 November, with another due to be launched for Finnish singer Erin Koivisto by the current Finnish ambassador on 3 December. A plaque to the late Liam O’Flynn will also be unveiled in the town before Christmas. Patricia Berry, event coordinator with Athy Town Promoters, spoke about her delight at seeing crowds descend on the town.